Each unit comes with a laser receiver standard, your choice of power options, and the best service and support in the industry. With the GL series, you can count on faster setups and more productivity ... for higher profits. 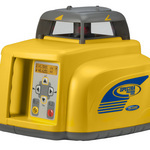 The Spectra Precision® Laser GL512 single grade and GL522 dual grade transmitters are rugged, cost-effective, automatic self-leveling lasers that do three jobs-level, grade, and vertical alignment. Both the GL512 and GL522 include a 2-way, full-function remote control with a built-in back-lit grade display. You can do everything with the remote control that you can do at the laser keypad, up to 330 ft (100 m) away from the laser-even from the cab of a machine! The ability to make grade changes from anywhere on the job greatly reduces setup time and speeds operation. Verbal and visual communication errors are eliminated. The Spectra Precision® Laser GL412 and GL422 Grade Lasers are cost-effective, automatic self-leveling lasers that do three jobs-level, grade and vertical alignment with plumb. Both lasers feature a 2-way, full-function remote control so you can make grade changes from anywhere on the jobsite for reduced setup time and faster operation. The GL412 (single grade) and GL422 (dual grade) lasers send a continuous, self-leveled 360-degree laser reference over your entire work area, and have a wide grade range so they can be used in a variety of slope applications. The LL400 is designed to be durable and reliable, day in and day out, and can be operated in the rain for superior drop and weather protection. The rugged LL400 can withstand drops of up to 1 meter (3 feet) onto concrete and tripod tip-overs up to 1.5 meters (5 feet). This strength, combined with full weatherproofing and dust-proofing, results in reduced downtime and lower repair costs. 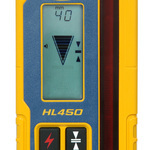 The HL450 features a digital readout of elevation that provides a numeric display of ± 40 mm or ±1.5 inches. The readout is displayed on the large front and rear LCD's and shows exactly how far the elevation is from on-grade. Accurate measurements can be made without moving the rod clamp, saving time and increasing productivity. 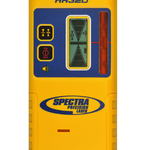 The rugged, flexible Spectra Precision® Laser HR350 Receiver can be used as either a handheld or rod-mounted unit for basic leveling and alignment jobs. Exceptionally easy-to-use, the HR350 Receiver features a durable composite housing that is both lightweight and capable of withstanding a drop of up to 1.5 meters (5 feet) onto concrete. 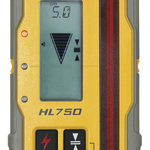 The HR350 Receiver displays the beam elevation on the front or the back side of the unit so its easy to determine on grade even in the poorest jobsite conditions. 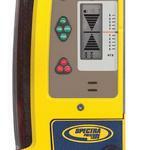 The Spectra Precision® Laser LL100 is a complete one man leveling crew in a case. A complete system is contained in a single hard-shelled, portable carrying case - the laser, receiver, clamp, tripod, and grade rod - for easy transportation, storage, and use. A standard case with laser and receiver only is also available. 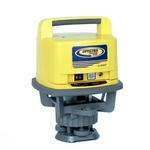 Automatic, self-leveling ensures fast, accurate setups. Easy, one-button operation requires minimal training. 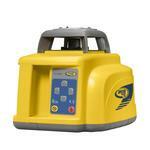 The Spectra Precision® Laser HR320 is a durable laser receiver for exterior leveling applications. LCD's on the front and back display a 5 segment grade arrow that indicates grade position. 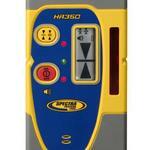 A loud beeper is designed to be heard on noisy job sites. Fine and medium accuracies are selectable to meet various applications and conditions. 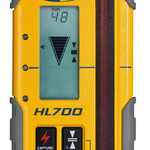 The advanced Spectra Precision® HD100 Laser Distance Meter is designed to give contractors a one-person distance measuring and estimating tool to measure remote and difficult-to-reach places. 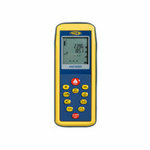 The multi-functional instrument ensures simple, quick, and reliable measurements. A visible laser dot lets you safely measure hard-to-reach places or hazardous conditions, such as high overheads, factory interiors, or over water. A built-in tilt sensor quickly and simply determines tilts up to ± 45° and prevents errors in measuring when the distance meter is not held level. This eliminates the need to constantly check a level vial. 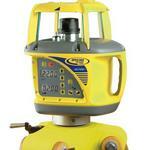 The HD100 also calculates areas, volumes, room dimensions, and various types of Pythagorean functions. One-person distance measuring with 1/16" (1.5 mm) accuracy up to 330 ft (100 m) allows safe measuring to difficult-to-reach or hazardous locations. Calculates areas, volumes, room dimensions, and various types of Pythagorean functions. Built-in tilt sensor quickly and simply determines vertical angles up to ± 45°. Stake out function for quick define / stake out distances. Timer function increases stability when taking measurements. Display is illuminated automatically for easy measurements in dark lighting conditions. Multifunctional end piece allows measuring out of corners, slots or from edges. The instrument detects the end piece automatically, which helps avoid expensive measuring errors. Waterproof to IP54 for use under all conditions. System contains a rugged pouch, wrist strap, target plates, and user guide. The Spectra Precision DG711 and DG511 pipe lasers feature the largest automatic leveling range in the industry, providing quick, easy setups, regardless of the grade. Unlike traditional pipe lasers, there is no need for rough leveling thus minimizes crew training. Simply set up the laser in the pipe, manhole or open cut, set the proper grade and start working. 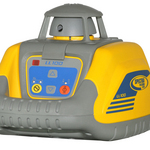 The DG711 and DG511 Pipe Lasers are built tough for long lasting performance and reliability. 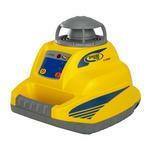 The DG711 and DG511 pipe lasers are completely waterproof and designed to ensure easy cleanup. Setup is fast with a full range of mounting accessories available, and easy to use with straightforward, "no-instructions-required" controls. In addition, through the Service Alert feature, they keep track of their own maintenance needs, indicating at pre-set intervals when it's time for a check-up. The DG711 has two additional features: Line Alert and Line Set-Check. Line Alert is a unique feature that is ideal for working in high-vibration or wet conditions where the pipe lasers may be disturbed. The beam flashes to notify you that the setup line has been disturbed, eliminating the necessity of rework. The Line Set-Check capability of the pipe laser allows you to raise the beam outside of the trench for fast line setup or checking. Raising the laser beam out of the trench to an above-ground stake saves you time- instead of having to move the excavator off line during setup of the pipe laser; you can just get on with your job. In addition, Line Set-Check feature is ideal for rechecking the line in pipe jacking pits after each push. 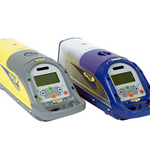 Spectra Precision pipe lasers feature a very rugged design and a variety of unique technological capabilities. These pipe lasers stand up to corrosion from acids, chemicals, salts and other destructive underground elements as well as to the physical abuse typical in the construction industry.